FORT STEWART, Ga. (AP) - Visitors to Fort Stewart will soon have to go through a background check if they don't have a valid Department of Defense identification card. The Savannah Morning News reports the new policy is set to begin Tuesday at the coastal Georgia Army post. Army Maj. Ann Meredith, the provost marshal for Fort Stewart and Hunter Army Airfield, says it brings the installation in line with others around the country and overseas. The new policy adds a national crime database background check. Meredith said the checks took an average of about eight minutes to complete in testing over the last month. Anyone convicted of major felonies, as well as some others, will be denied access. Those denied access will be allowed to submit a waiver requesting access. ASBURY PARK, N.J. — Even as federal inspectors repeatedly warned that patient wait lists were having a detrimental impact on care, the troubled Veterans Affairs health system handed out $108.7 million in bonuses to executives and employees the past three years, an Asbury Park Press investigation found. WASHINGTON — House appropriators on Tuesday killed an amendment that would have kept alive the Air Force's A-10 fleet, becoming the first defense panel to endorse the service's cost-cutting plan. The House Appropriations Committee broke with the House and Senate Armed Services committees, which last month used budgetary cuts from elsewhere in the Pentagon's budget to keep the A-10s flying for one more year. The amendment to keep the A-10, offered by Rep. Jack Kingston, R-Ga., was shot down via a show of hands, with 13 members voting for it and 23 voting to kill it. It would have transferred from other parts of the Air Force's operations and maintenance account $339.3 million "for sustainment of A-10 aircraft operations." WASHINGTON— The House Armed Services Committee will investigate the Obama administration's swap of an American prisoner held for five years for five Taliban leaders that caused a political firestorm over the lack of congressional notification and fears the high-level Taliban could return to the Afghanistan battlefield. "We ought to look at the price," Rep. Howard "Buck" McKeon, R-Calif., chairman of the panel, told reporters after administration officials held a tense 90-minute, closed-door briefing for House Democrats and Republicans. Officials from the White House, State and Defense departments and the intelligence community defended the exchange of Sgt. Bowe Bergdahl, who was captured in June 2009 in Afghanistan after he disappeared from his infantry unit, for five Taliban militants from the U.S. military prison at Guantanamo Bay, Cuba. The Air Force has further beefed up its bomber presence in Europe, deploying two B-2 stealth bombers for military exercises in the region. The B-2 deployment is another show of Washington's effort to reassure allies in the region amid Russia's recent bluster. The aircraft are assigned to the 509th Bomb Wing out of Whiteman Air Force Base, Missouri. On Sunday, they joined three B-52 Stratofortress aircraft already deployed to RAF Fairford, a British air base west of London.? All five of the aircraft are capable of delivering nuclear weapons. Middle school students from around Central Georgia blasted off into the world of science and technology this week. They put their aerospace and rocketry skills to the test at Starbase 2.0 at Museum of Aviation in Warner Robins. The week-long camp welcomed kids that participate in school science clubs. They tried out new experiments, like launching rockets, that can be used in clubs next school year. People remembered the service and sacrifice of D-Day here in Central Georgia. 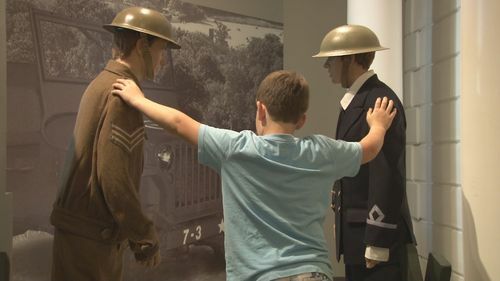 They toured the exhibit devoted to honoring and preserving the history of that day at the Museum of Aviation. The interactive exhibit opened in 2008. It tells the story of the paratroopers that glided into the water and onto the beaches of Normandy. It also includes a recreation of General Dwight Eisenhower's planning room, as he lead the allied forces.